In 1983 Circles was first published to provide a “road map” for relationships and relationship building skills and the paradigm has continually evolved to be relevant for changing times and technology. It is exciting to have a seminal work used internationally and as relevant to today’s culture as it was long ago. 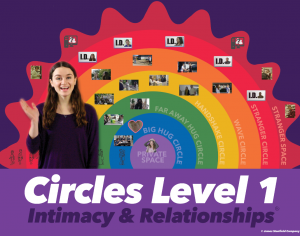 Circles Level 1 is now in its 4th edition and includes addressing such topics as social media and living more inclusively. The Circles Utility App is a portable tool to be an ever-present reminder of boundaries and safety. So what is the Circles paradigm? It is a series of concentric circles starting with the individual and their self-esteem, self-care and self-knowledge of how relationships are defined, starting with them! Touch, talk and trust are learned here and are the highest in this inner most Circle, after all, “self-love” is esteem, accomplishment, meeting goals and growing. Surrounding the self, in the purple private Circle, are people who are meet everyday and Circles demonstrates the quality and quantity of each relationship. It is concrete, organized and demonstrates the many levels of relationships, and how to build and maintain them, as well as dissolution of a relationship. Intertwined with this are all topics in social/sexual information and the programs are designed to be used across different age groups and abilities.